Most poets will all too happily speak of influential voices, mentors, and inspirational books. 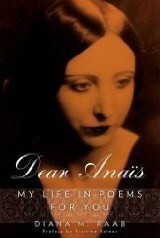 Raab has taken it one step further in Dear Anaïs: My Life in Poems For You, a book that is nothing less than a tribute. The French author’s famous diaries provided an education for Raab, one that created a personal connection between two poets who never actually met. Yet, the words and language of Nin have the power to transcend time, place, and even mortality, so Raab has discovered. orange peels, apple cores, grapefruit rings. in a new form—round, red, and juicy. In such simple experiences and recollections, Raab is able to expound the cyclical nature of life and all its beauties. The resurrection of nutrition—and love—through time and patience results in a bounty of pleasure. Composted fruits, yes. But this is representative of life’s experiences and small moments that pass us by, only to be remembered later in life, renewed in their significance and contribution to our life experience as a whole. Life, in its many tiny moments that culminate into experience, is full of detail. There are stories everywhere. There are stories behind every thing, every moment, every encounter. Raab shares moments from her own life story, dedicating her memories in poetic tribute to one of the world’s most treasured diarists. In the preface, Raab credits Nin for teaching her “the intrinsic value of the written word; intrinsic, not as so many pennies a page or as literary acclaim, but as one’s own words delivering comfort in the days ahead.” Sharing a parallel love and dedication to journaling, both Nin and Raab began the art at a young age, enjoying the personal release of expression for no other reason than personal pleasure. As the preface suggests, the act of writing should be viewed as art itself, not judged by publication or other public forms. Yet, Nin’s diaries are public. So is Raab’s tribute. We are grateful for both.